TripTic to Aiken Creek Camp, in the North Arm of Moria Sound on Prince of Wales Isld. TripTic the Blue Lake from (PAKT) ... this can be a difficult landing. TripTic to Dan's Hideaway - a lovely residence on Prince of Wales Isld. TripTic to High Lake Lodge, in the Kassa Inlet on the west side of Prince of Wales Isld. TripTic to Spotted Lake Retreat ... full service lodge, wildlife, tent camping, etc. TripTic to Summit Lake Lodge ... not a landing zone for the timid! The charters help you learn the territory, they expand your knowledge of the visual waypoints you are encountering so you will know where to make your turns, ascents and descents. Also, it is easy to set a GPS and fly to a waypoint for a lake or a cabin, but what do you do when the weather is not ideal? (You will see, when you download the weather from the internet to make your flight more realistic, that 8 out of 10 times, you are at minimal VFR conditions). But you have people vacationing out in the forest in the cabins that need to be picked up "on Monday" and other visitors who will take their place "on Monday." If you wait for the blue skies, you will have some starving people out in the wilderness and a long line of people in your waiting room drinking your free coffee! Ceilings of 2000 feet are typical ... but the mountains range from 2000 to 7500 feet. You may easily get above the clouds and fly to a GPS waypoint, but where are you going to come down through such a ceiling with hundreds of rocky peaks below you? The only way to solve this problems is fly treetop, above the flat and [mostly] predictable surface of the water. This means the route you take may not be direct at all, but will be winding through the maze of mountains and fjords. None of these have electronic waypoints ... you must learn to recognize them, visually. The charters teach you how to do this. You can read through the charters on the web, and when you decide upon one that you want to fly, you can just go to the "Printer Friendly" file and it will download for you quickly for that particular charter. Print it out and you are on your way. Also, you can "enlarge" the map for printing two ways, by clicking on the Enlarge Map [here] or by just clicking on the map itself. It is suggested you print that also as it will be a handy reference for you while flying. Imagine you are a bush pilot sitting in your Ketchikan area office, you decide to make your own TripTix (trip tickets) so you can remember how to get to a particular location. You grab a pad of Misty Moorings, Inc paper, sit down to the typewriter and type out the directions so you can go find the place some other time ... or so another pilot can could find the location. You stuff these into the map box on the plane so the next time someone needs to go to a particular location, all you have to do is dig it out of the map box and scotch tape it to the windshield. The Purpose of the TripTix is to help people quickly find a particular addon scenery using TreeTop VFR planning and directions. All of these are created for low level flight for unfavorable, but must-fly weather. Not as informative as the Charters, but they will "get you there" the first time safely. Print them out and scotch tape them to the panel and follow your way along. These too are designed to help the virtual pilot "learn" the area as landmarks are pointed out along the way for the pilot. (TripTix is "plural" ... but you will also see TripTic which is singular ... meaning "Trip Ticket." There are helpers that we have added for the novice bush pilots. If you have FSNavigator, routes have been created for all the charters. The routes can be downloaded from within the charter package. These plans will fly you through even the most treacherous areas and get you through safely. Also, for the Misty Fjords area, there is an EZ-Landmark database, with over 400 waypoints made especially for Misty Fjords, that can be downloaded and used with the EZ-Landmark program (see below). This database can be downloaded from the table at the top of this page. With the [shift F11] stroke you can make these waypoint names appear and disappear. You do not need these programs to fly these charters, you can fly them purely VFR. All the headings are listed for you. FSNavigator is a fully integrated plug-in for FS2004, FS2002, FS2000, and FS98. The program is activated with the F9 key. Pressing this key makes Flight Simulator change its face to become FSNavigator. At the same time all Flight Simulator functions continue normally. The Menu and all FS keys remain active. In the alternative display mode FSNavigator is a separate window, that can be positioned freely anywhere in the Flight Simulator Window. 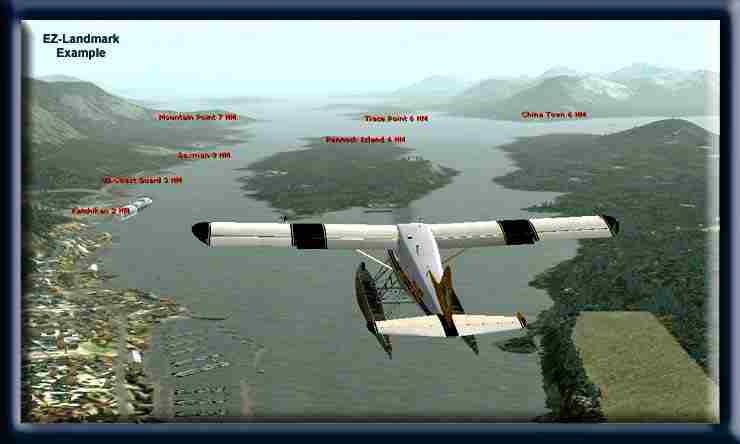 For display of the world map FSNavigator uses your own Flight Simulator scenery. Addon scenery which has been added to your scenery library in FS, is also displayed on the world map. FSNavigator can be used in full in a trial period of 20 Flight Simulator sessions. After this the world map will be empty. If after the 20 free sessions you want to use the program without restrictions then a registration key is necessary. [click here] You can also purchase this program from SimFlight [here]. Once you have placed them in the folder, you can load them. INSIDE FSNavigator go to the 'open file' (at the top, 2nd icon from the left in the second row) click it and select the plan you want. Note: don't try to use these plans using an F-18 (unless you have crash "turned off!"). Pilot's Note: In the FSNav Options menu there is a menu item called Settings. If you select the FMS tab and Mode 2 and make the following changes you will have control of your aircraft. 1. The HDG scroll down to set Heading. This will cause FSNav to set the Heading Bug on the gyro but not set the auto pilot heading. You can make it set the heading with CTRL H, then the autopilot will follow the flightplan in FSNav. 2. The ALT scroll down to Set Manually. This will allow you to set the altitude to whatever you want with CTRO Z. (You will use this often for Treetop Flying in these charters). While flying in the simulator, do you peer out the window towards the ground below and wonder what you're looking at? What is that mountain, this inlet's name or that river basin or glacier? EZ-Landmark is like having your own private tour guide. The idea behind this ingenious software is simple: display the name of the landmark for you. The program includes more than 170,000 600,000+ sites and other databases for the world as well. Misty Moorings, Inc. adds one more database for you. The latest database is available by clicking on the picture below. This database will name the glaciers, mountains and key waypoints in Misty Fjords. We continually update the database as we add sceneries and as we too learn more about the area. (And if we miss a landmark you think should be there, contact us and we'll put it in for you. Then you can download it later and your waypoint will be there. Watch for the latest date on it. To view the landmark labels, you press [Shift F11] and press it again and they disappear. The Misty Fjords database has about 400 new waypoints in it that cover the entire flying area of the Misty Fjords scenery package. 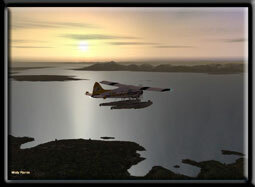 Turn on the flight simulator and under the options for EZ-Landmark's dropdown, put a check in the "Misty Fjords" box. Your new database is now active. Check often with this website to make sure you always have the updated version, we continually add to it as new scenery addons are created. EZ-Landmark may be purchased from Abacus [here]. Often these files will not be available for these charters. These only work when you are flying from and airport to an airport. Our charters may start from an airport such as Ketchikan Int'l PAKT, but you are flying to a cabin or a glacier, not another airport. So such plans do not work for most of these flights. (But that's why we fly VFR and not IFR in Misty Fjords!). But don't let this stop you ... treetop VFR is not about autopilots and electronics ... it is about eyesight, knowledge of the area and sometimes courage. If the plan is available, then it must be carefully placed in your FS9 file. This can be typically found at: C:\ Documents and Settings\[your name]\My Documents\Flight Simulator Files\. An easy way to find your file is to do a SEARCH for *.pln and you will see where your FS9 plans are being stored. Place .pln files in that same location. The Charters will have briefings that you can bring up from the kneeboard (F10). These will be set up to give you VFR directions in BOLD type and historical, geographical, general narrative in italic type. If you take a ride in a bush plane around Ketchikan, you'll find your pilot not only knows how to fly, he or she usually also knows how to TALK! They love to tell stories about the area and point out sights out the window as the beautiful world of Misty Fjords goes by. The charters are meant not only to get you from point A to point B, they are also intended to give you information on the Misty Fjords National Monument and the people that live and work there. You can download the briefings from the table at the top of the charter pages. If you have any questions, comments or additions, you can contact us at mistymoorings@jdlinn.com.